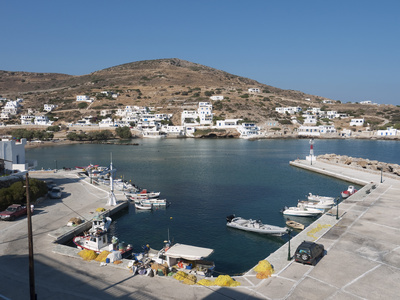 Sikinos is situated in between Ios and Folegandros. The island has an area of 42 km² but only about 300 people live there. Sikinos is on of the least touristy places in the Cyclades. Visiting the islands in many ways feels like travelling back in time. It's fantastic. You may or may not meet other tourists but even if you do it's fine. There is a fair chance that they are like-minded people, explorers on a quest to discover the real Greece. No one ends up on Sikinos by coincidence (except me). Such knowledge creates a bond. What is there to do on Sikinos? Quite frankly: nothing. There is absolutely nothing to do on Sikinos. The best the island has to offer is solitude and friendly locals. You can go for a walk for example. The island is mountainous with green and fertile valleys. The locals make their living with farming and fishing. It is a modest life but that doesn't mean they aren't happy. Quite the opposite; my impression was they live exactly the life they want to live. There are three settlements on Sikinos; the port Alopronia and the two mountain villages Chora and Kastro. The two are actually hard to distinguish. They have more or less grown together. All ferries to Sikinos arrive in Alopronia. The port is so small it doesn't even look like a village. There are a couple of restaurants though and a few rooms to rent. The local beach is all right but not as good as the beaches in Agios Nikolaos and Katergo. Both can be reached by foot. Worth visiting is the small local museum. For a change it is not about archaeology but about Olives. The best place to stay in Alopronia is Pension Flora. (Phone 2286051214). It is about 500 meters walk from the port but easy to spot. Porto Sikinos is closer but with 60-85 Euros for a room slightly overpriced. (Phone: 2286051220). The best restaurant in town is Lucas. He also rents out rooms. (Phone: 2286051075) Not a bad choice is Ostrias. The place is tiny so you won't have any problem shopping around. Keep in mind; most places will be closed from late September. Bring enough cash as there is no ATM. You might be able to cash a traveller cheque but I wouldn't rely on it. The two villages are so close together that they appear as one. You will see the typical white houses, narrow alleys, wind mills and a beautiful church. The main difference to other islands is; this is the real thing. These villages don't try to impress tourists (since there are none). These places exist for hedonistic reasons. These place are so lovely because the people living there like it that way. There are a couple of restaurants and very few rooms to rent. Recommended is the taverna Klimataria. Kastro is considered the prettier of the two villages. Since both are on a hill you get a nice view from there. Off the beaten track – as strange as that sounds in regards to Sikinos – hiking is dangerous and difficult. You should stick to the few hiking paths. Best ask. Recommended is the short hike from Chora to the monastery Zoodochos. You can visit and – even better – admission is free. The path is pretty steep but the view is spectacular. A longer path leads down south to the second monastery on the island; Episkopis (also Heroon). The monastery is closed these days. It is pretty much a ruin now and would need some extensive building. At least they built a road now that leads to it so may be at some stage they will get working on it again. There is no airport in Sikinos but regular ferries to Folegandros, Ios, Santorini, Paros and of course Athens. There are some connections to Milos, Naxos, Sifnos, Serifos and Kithnos. For an island so far off the beaten track this is astonishing. There is a bus or so they say. Apparently it does go in high season but I've never seen it. It connects the port with Chora and Kastro (every hour) and once a day to the monastery Episkopis. It leaves you with time enough to visit it. This is hear saying! There is no point getting a rental car on Sikinos since there are hardly any roads. A scooter might come in handy though.